Other populations occupied this area of northern Illinois before Fermilab physicists came to the site. As Native Americans vacated, pioneers in the 1830's moved west to homestead and they began to control development around the Big Woods at the outskirts of Chicago and formed counties and towns. Plank roads and railroads brought families from Chicago out to the Fox River valley for clean open space and opportunity. 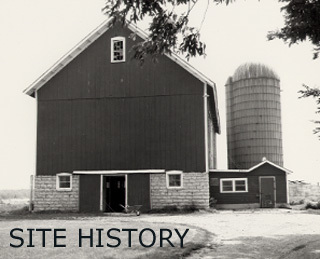 By 1964 the border of DuPage and Kane Counties contained farms and a small housing development called Weston. In 1966 the area was included in the Illinois proposal for the AEC's 200 GeV Accelerator Project, a U.S. high-energy physics laboratory. The Fermilab Archives has collections on the history of the farms and the Weston subdivision which, from 1966 to 1969, became the site for the National Accelerator laboratory. These collections include documents, photographs and interviews conducted by a team of historians from Northern Illinois University in 1998.